Thursday night the Greenway Foundation honored Mark Smith with the 2011 Friend of the River Award at the first annual Gala on the Bridge. 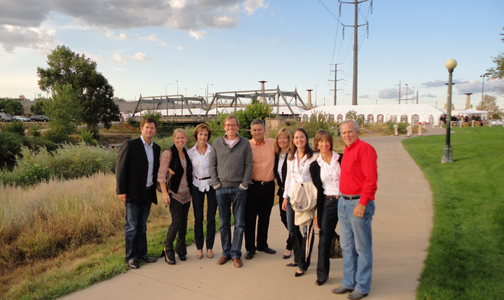 The Greenway Foundation has been an advocate for the South Platte River since 1974. Over the years, the Foundation has been involved in the creation of over $100 million of environmental and recreational improvements along our urban waterways. Last night the incredible gala was located on the 19th Street Bridge over the Platte River. About 400 people, including Governor Hickenlooper and Mayor Hancock, gathered last night to celebrate Mark Smith’s contribution to the Central Platte Valley. There was a beautiful tent set up over the bridge and a great live band to help get the night started. A delicious dinner provided by Three Tomatos included a Colorado Trout appetizer, Game Hen on a bed of mixed vegetables and apple tarts for dessert. Mark’s passion for the Central Platte Valley stems from his love for the place he was born. This was a wonderful tribute for his vision of transforming old railroads and warehouses into a beautiful thriving neighborhood.